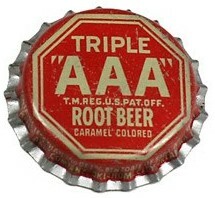 The Triple “AAA” Company was a root beer manufacturer that started in 1937. They supplied extracts and syrups to soft drink bottlers, having created their product to compete with other soft drink makers likes Hires and A & W. They were a small company that went out of business by the early 1970s. They promoted their root beer as “delicious, healthful and refreshing”. This bottlecap has their distinct octagon-shaped logo. There’s not much out there on them, so if you can add anything, we welcome your comments.